2. Saute the onions for a minute or two. 3. Add ginger, garlic and green chillies. 4. Stir-fry for a minute. 5. Now add the chopped tomatoes and cumin powder. 6. Cook for a minute and add the prawns. 7. Cook till prawns turn pink and start to curl up. 8. Add salt and stir quickly. 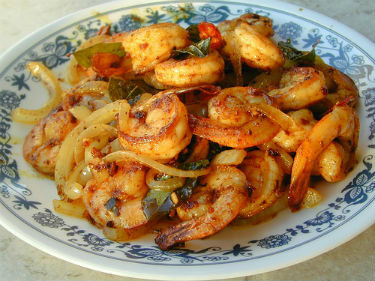 Feel free to comment or share your thoughts on this Prawns with Onions Recipe from Awesome Cuisine.